Whether you’re about to run your first 5k or 10th marathon, pre-race nerves affect almost everyone preparing to step up to the start line. So most importantly, don’t feel alone, it’s nothing out of the ordinary. I’ve seen racers throw up, cry, complain about injury or being underprepared or even exhaust themselves due to an over zealous warm-up. It’s all part and parcel of being a competitor. But whilst pre-race nerves are normal, it’s important that you understand how to control your anxiety because at the end of the day it can affect your performance. Try going through these 10 techniques in your next race to help you settle your pre-race nerves and turn that anxiety into adrenaline. Increased breathing and heart rate are the first telltale signs that you’re body is going into race mode. Think back to your training, I imagine part of it was to control your breathing. Same applies here at the start line, you want to keep it under control. With an elevated heart & breathing rate, you’re going to feel fidgety and on edge. You’ll want to try and lower this. A great way is to find a quiet spot where you can sit down, collect your thoughts and focus on your breathing. Take deep breaths in through your nose and out through the mouth. Keep going until you feel your body start to relax. A relaxed racer is a better racer. Did I train too much? Did I train too little? Is my hamstring a little tight? You’re going to be asking yourself a multitude of questions at the start line, most of them questioning yourself. Have faith in your training and the work that you’ve put in. It’s much easier to second guess yourself rather than be confident. At some point, you’ve just got to put the hard hat on and get on with it. Trust me, you’re as prepared as you’ll ever be. Evaluations can wait till after the race. Maybe you want to listen to some soothing Enya to calm your pre-race nerves, or some heavy metal to get you in the zone? Whatever your choice, music can be a great way to alter your emotions. This is all down to the individual as everyone has his or her own tastes. Personally, I like to listen to pump up music to get my mind right before a race. I like to turn anxiety into adrenaline by feeling confident about myself. Something with a high BPM is great for this. There’s nothing worse than getting to the start line and seeing your phone is nearly out of battery, or anything trivial for that matter. It can completely throw you off your game. To try and combat any thoughts of doubt by being well prepared the night before. Make a list, prepare everything the night before and leave stuff that you don’t need to think about to a loved one. Your focus needs to be on the race and the race alone. Undoubtedly you’ll want to have a great warm up before you race, but keep it in moderation. You will have been through this process plenty of times in your training; don’t start to alter it now. 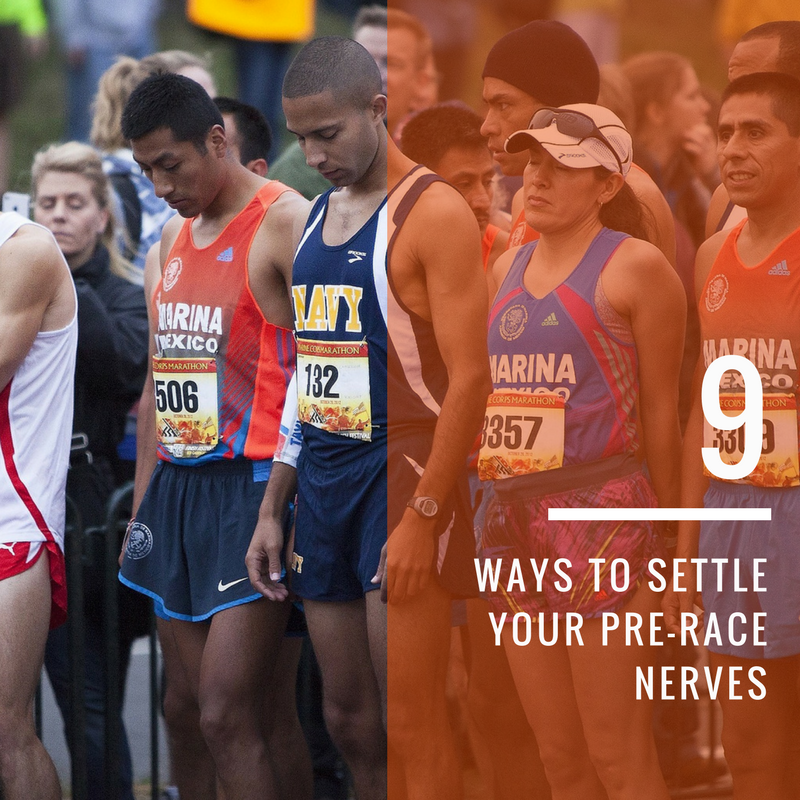 Your muscles are going to naturally feel tighter due to the pre-race nerves. Take time going through your normal warm-up routine and don’t copy what people are doing around you. Just because people are jumping around and running shuttle sprints doesn’t mean that you have to! Do what works best for you, only you know that. Going through your stretches can also be very therapeutic so use this time to collect your thoughts and think about the task at hand. Why are you doing this race? Are you fundraising for a cause you support or going for a new PB? Whatever the reason, put it at the front of your mind. When you hit the wall (and you will hit it), you’ll want something to draw motivation from. Nothing settles your pre-race nerves better than giving a greater purpose to what you’re doing. Sure, it may only be a 5k race, but the money you’ve raised for charity will go a long way for the small amount of pain you’re about to endure. Find an intrinsic motivation and grasp it, you’re not doing it for the money or the fame, it’s all about you and your goals on race day. With team sports, it’s much easier to visualise the desired outcome, you know how many points you have to score to win. You can quantify it. With racing, there’s only ever one winner of a race, and most likely, that person isn’t going to be you. Sorry, but it’s true! This means you need to have goals in your mind that you want to achieve that can be measured throughout the race. Nerves don’t only affect you at the start of the race; they can happen in the middle too. Say you’re running behind your target time, you need to keep your cool and slowly work your way back to that pace. If you try and rush it, you’ll most likely burn out too quickly. Slow and steady wins the race (notice we omitted the slow part), you need to be steady in your progressions, not jump from 0-60 in 2 seconds. Whilst this may seem obvious, it’s really important to try not to vomit before a race. Runners Connect explains that adrenaline disrupts the stomach because it pulls blood away from the intestine and sends it to the heart, brain and skeletal muscle. Without proper blood flow, the body can’t move food through the digestive system. This can lead to vomiting. This is the most important point of all. No one is holding a gun to your head, you’ve chosen to do this race and you’ve trained bloody hard to get where you are now. It’s too easy to get bogged down under pressure. This is your chance to improve yourself, tick a box off the bucket list or raise funds for a great cause. You’re doing a great thing! Try to enjoy the process as much as possible and most importantly, SMILE! You’ll be gutted when it’s all over.